Perry Nicholas is an acclaimed regional poet well worth reading… Nicholas is highly accessible but certainly not prosaic or simplistic; he can exhilarate a questing mind, delights with his gifted use of language, and he entertains with the aptness of his startling metaphors. Importantly, Nicholas’ work permits us to see more deeply into the extraordinary and into the conventional, leaving us with the satisfaction of understanding many of our experiences more fully, more richly. 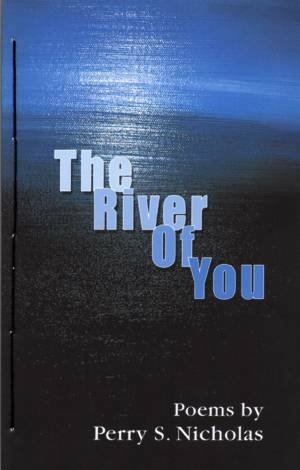 The River of You is a combination of poems inspired by other writers or artists, family, real and imagined relationships that hopefully transcend ego and translate to the universal. A poet must be constantly moved by others, influenced by reading and history. He extracts a spark from anywhere, wraps himself around an idea, and comes up with his truest sentence (to paraphrase Hemingway). My writing process begins with a reverence to what has come before. I sift through it for a tiny truth, wrap my own voice around it, and follow up with painstaking revisions to tell the story as clearly and vividly as possible. This is my passion, my humble responsibility to the reader and the artists who have molded me. This book is my tribute to what has influenced my life-literature, languages, family, and friends. In turn, I hope it touches the reader in his or her personal journey. was especially weary of words. though the words are willing enough. his breath as he covered her. To love is very difficult. again, for the hundredth time. missed his sideways look towards the door. you should have known, he wasn't much of a hugger. you what I know about men. Just boys. at one of your lonely corner tables. you peel it open, the more it makes you cry. Men, they're never good with explanations. Perry S. Nicholas is an English professor at Erie Community College North in Buffalo, N.Y., where he was awarded the 2008 SUNY Chancellor’s Award for Scholarship and Creative Activities. He was nominated three times for the Pushcart Prize, in 2006, 2007, and 2008. His poems have appeared in Common Ground Review, Fourth River, Caesura, Word Worth, Not Just Air, Hudson View, Language and Culture, Nickel City Nights, Seven Circle Press, Feile-Festa, Skyline Magazine, Louisiana Literature and will appear in the 2010 Chautauqua Literary Journal.